Is Splenda safe? Unfortunately, the Splenda craze has taken a toll on the American people. Wrongfully marketed as a healthful alternative to regular sugar, ‘made from sugar so it tastes like sugar’, Splenda is actually one of the most dangerous forms of synthetic sweetener. Sucralose, the chemical name for Splenda, has been implemented as an alternative to sugar, used widely in chewing gum, bakery sweets, diet sodas, fruit juices, and other oddities contrived as food. The sweetener is actually more chlorinated than aspartame – and consequently not much different than aspartame in terms of it’s effects on the body. Through the extensive testing processes of the FDA, the sugary poison was considered safe for human consumption in 1998 after the effects were studied on over 100 animals and humans (only 2 of which were actually humans). And thus yet another artificial sweetener was born, putting people’s health at risk through marketing and profit-driven goals. What comes as the greatest surprise, however, is the fact that all of the testing done with Sucralose was only completed on around 40 people total – much of the studies’ goals were only to test its effects on the teeth of the subjects, and virtually nothing about the toxicity of the sweetener whatsoever. 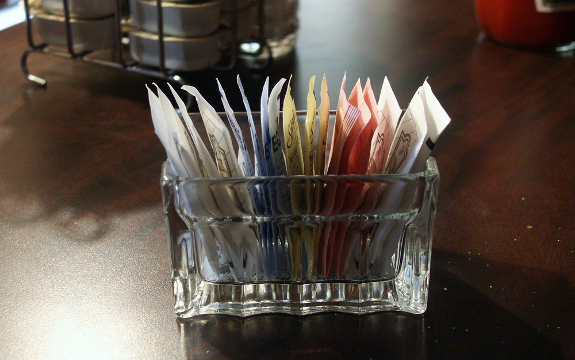 So, is Splenda safe? The worst effect of them all? The stomach is essentially cleansed of any healthful bacterium existing within the stomach lining, in addition to increasing pH levels within the intestines. This effect directly stimulates/upsets ghrelin levels (hormones responsible for stimulating appetite, resulting in increased cravings for carbohydrates and other non essential food sources). What is so wrongful and vile about the substance is that it is not only sold to consumer food product manufacturers, but also to a fair share of big pharma. This means that the medications that you buy may still contain the sugar sweetener without you ever knowing, as many companies are deliberately not listing Sucralose as an ingredient at all. This adds just one more reason to break any reliance for pharmaceutical medications. But instead of Splenda rightfully discontinuing their toxic creation, they have decided to make it sound even better for consumers under the name Splenda Essentials, Unfortunately, this is marketing deception, as you are still consuming the highly toxic Sucralose. So, is Splenda safe for consumption? Why is it still on the market?If it is that terrible,it should be removed. What do you think about brown sugar? I had the same symtoms and was near to breaking point. I cut out all the diet drinks and hey presto after a week I was like a new woman. Fortunately Ive never had sweeteners in hot drinks so that wasn’t a problem. Be careful with processed foods a lot of them have artificial sweeteners in them. From being in pain for over five years, I can run around with the grand children. Also since giving up this poison the weight is falling off me. http://www.sciencedirect.com/science/article/pii/… < what about this, would author respond to this please . You do not say what OTHER non governmental studies show that Splenda isn't safe! Bad journalism because you should always reference your sources on something like this. Is there even 1 peer reviewed, published, scientific study that anyone can reference that supports even 1 of the claims made in this article? Why would you even need a peer reviewed study? You can read Wikipedia and find the complete chemical schematic. Why are we so willing to put scientifically engineered chemical substances into our body? Why put chlorinated sucrose in your intestines? Organic honey was recommended by my doctor after I went through two bouts of pancreatitis — which twice as painful as childbirth–from Splenda. Love the honey but it made me think why must we have sweeteners anyway? Here's to going cold turkey and finally tasting food as it was meant to be. SweetLeaf SteviaPlus is all-natural sweetener that I put off trying for so long, but when we ran out of Splenda, I tried it. I never noticed an aftertaste. I've decided it is healthier and sweetens quite well, so I am sticking with it regardless of what the FDA comes up with, because the FDA okayed medication that was a placebo for five years before pulling it from the shelf. I have lost all trust in the FDA. As for side-effects of Splenda, what is considered a significant amount? I used it in two cups of coffee a day, max! I've lost a many pounds using certain diets (like the South Beach), on which Sucralose and sugar substitutes have played a big role. I have eaten a lot of splenda, mixed into oatmeal bars and coffee. I have to weigh (pun intended) the effects of the wieght loss with the side effects of the substance. I've felt gas and little else. The critical question to me is whether Sucralose has been linked to cancer, even if in animals. Are there reports on that issue? If not, I will deal with the side effects because the negative effects of too much sugar is real, documented, and hard to reverse. But, if or when I hear of a legitimate report stating that Sucralose products are linked to cancer, I am dropping it immediately. Stevia, if you can stand the taste, is always a better option. The affects on blood sugar is reportedly null. You need references; especially when you are ranting. People will not find you credible. If you want to be taken seriously, you must back up your claims by pointing readers to where you got your information, otherwise you come off like you have an agenda. I am discontinuing use of all artificial sweetener, because I do not believe in their safety. Common sense should tell us that if it is "not natural" it is most likely not good for us. Peanuts are "natural" and yet somewhere around 150 to 200 people die in the U.S. each year because of food allergies. It's estimated that around 50 to 62 percent of those fatal cases of anaphylaxis were caused by peanut allergies. Just because it's "natural" doesn't make it "safe". When was the last time you ate some "natural" poison ivy? Common sense tells me that "natural" is one of the most abused, butchered, and exploited words in the English dictionary these days. Been using stevia for some time in my coffee which I drink a lot of. It's amazing stuff. You only need a little amount of it because it is so powerfully sweet. I can certainly recommend it. Great point that the source used for this article is from "TruthAboutSplenda", which is written by The Sugar Association. This source is obviously completely bias. Not sure I trust the "low-carb" site either though as it is biased too (written by an author of a cookbook that uses solely Splenda as sweetener). Would be nice to just get the facts from an unbiased source since I've been using Splenda/sucralose for years. I have been using Splenda almost exclusivly for at least three years. I am a borderline diabetic. I have had quadruple heart bypass surgery. I am feeling fine. I tried various types of artificial sweetners (not any of the saccarin types, I refuse to ingest a known carcinogin). I thought that Stevia was going to my sweetener of choice but, I could not take the way it tastes in tea. I cannot say that I have experianced any real identifiable side effects so far. I have had diareah from time to time but, not more so than before using Splenda. I have had gas from time to time but, no more than before. Looking over all the myriad ill effects I have seen listed on some web sites, I cannot see this list in my own experiance. When I see a long list of bad things attributed to a single substance, I feel like it is the same as when someone attributes a host of good things to a single substance, probably not true. My A1C is no better and no worse over all this time, from a low of 5.8 to a high of 6.4. I second that. I am also border line case and diabetes clinic recomended splenda to me and A1C is gr8 and no side effects!!! too much sugar ingestion in diabetics results in heart disease, kidney failure, impotence, peripheral vascular disease, blindness and other serious conditions. even if you are not diabetic, secondary results from sugar are similar, although slower to develop. if you compare these documented effects against the hysterical claims of the anti-splenda lobby, the decision is easy. artificial sweeteners may be the most important discovery for diabetics since the development of injectable insulin and oral hypoglycemics. I do not consider myself a hysterical woman. My history — 20 years ago was exhibiting pins and needles in my face , arm, leg on my left side. Many tests later and referrals to docs for a diagnosis of ms were all negative. My challenge was to find out what changed for me to bring this on, Diet Pepsi and McDonalds Tea with four nutraswet (aspartame). Two large teas to start my day and between 4-6 diet pepsi every evening. A simple combo for many many women, and add to that almost no simple water, eventually your body rises to a toxic level storing the chemicals which started causing me a multitude of symptoms. I went cold turkey and deleted all aspartame and started drinking water only. In a matter of weeks my symptoms disappeared. Alas old habits die hard, I love tea, hate coffee, so eventually I started to drink tea with sugar, but felt guilty for the sugar, a friend who did not know my history told me splenda would be a great substitute, so last year when I became home bound caring for a stroke victim hot tea with splenda became my drink of choice. But since it had been almost twenty years since my symptoms it never occurred to me to research this product before ingesting it. Joint pain, heart racing, pain all over my body are the main symptoms this time, I was ready to think I had arthritis, lupus, but my son asked me to stop splenda for a week. In three days I could walk down the stairs without pain, my thumbs and wrists could be flexed in the mornings without pain. In the evenings it would be so bad that if I sat for a period of time and stood up to go to bed I literally would fall down from the pain to walk. As long as I kept moving it didn't hurt, but the minute I rested and then tried to get up the pain was excruciating. I am not hysterical, I am stating a fact. Ten days after my no splenda experiment, and still drinking tea with plain old sugar I can run down my stairs and run from the car to the mail box. I have been using a personal trainer for a year to keep my joint pain at bay thinking I just have to keep moving. He can attest to my experiment and my pain! There is a huge problem when a huge corporation gets away with this farce on the people for the almighty dollar. It should be taken off the market. Think of how many medical dollars are being spent . . . . This is not a small hysterical problem. No way. Your anecdotal case is just that: anecdotal. I use Splenda everyday and I don't have those problems. I know several other people who use Splenda and they don't have those problems. If Splenda caused all the symptoms you cliam it does, it would be obvious to everyone. Human beings are pretty good at deductive reasoning—the problem is that we sometimes forget that deductive reasoning works much better when we have more than one empirical case to work with. I find that stevia has an after taste that I don't like (unless there's one on the market that doesn't that I haven't tried yet). Fortunately,for me, so does Aspartame and other artificial sweetners. I hate the tinny taste. So, I have hunted high and low for an alternative. I tried something called liquid splenda and didn't mind the taste. Know after reading your report I feel like throwing it in the garbage when the bottle I ordered on line comes in the mail. At this time I am using just plain old sugar until I find something to replace it. I can't drink just plain water. It is literally hard for me to swallow. I talked to my doctor and he thinks it's because water has tension. I thought I was the only one with this problem but, I am not. I am looking for something to add to my water that will make me a water+ drinker. Any advise would be appreciated. Thanks. Kim PS just lemon in water doesn't work for me either. have you tried the flavored Stevia? Is the source of the water an issue? Tap water is vastly less palatable than filtered or spring water. Water that is "hard" versus "soft" may make a difference too. How about the temperature of the water? There are 2 other Natural and GMO sweeteners, neithet have the after taste, however, they are a little more expensive. Both can be found at Super Supplements and I have also found Xylitol at Fred Meyers, however, FM is more pricey than SS. Try Mio sweet tea, I love it in my water.